Effipro Medium Dogs is for use in dogs weighing between 10 and 20Kg. Use Effipro medium dog in the treatment and prevention of infestation of fleas for up to 8 weeks and ticks for up to 4 weeks. 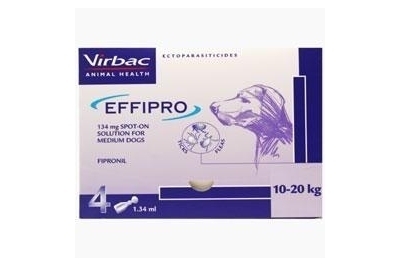 Effipro Medium Dogs administration: by topical application to the skin, 1 pipette of 1.34ml per dog.